GAME REVIEW: Doom - "It Blows the Competition Away"
Doom 2016, a "soft reboot"
The opening minutes of Doom, briefly, inspire a sense of dread. Not the kind of dread usually associated with hell, but the dread that this isn’t the real successor to Id Software’s riotous 1993 classic shooter. Soon after taking control of Doom Guy and blasting some demons, the game takes control away from you again and starts playing an audio transmission from a nearby computer that, of all things, introduces a plot. Thank goodness, then, for Doom Guy. Impatient as the player, he simply pushes the computer to one side and sets off at a dead sprint for the nearest door and gets to work blasting monsters. It’s a terrific start to the game and a huge statement of intent from Id. Doom is back in a big way and literally pushing the cutscene heavy, story driven shooters of the last few years aside while it takes the genre back to what matters: shooting everything that moves. It’s hard to overstate how successful Doom is at achieving this singular goal. It’s a triumphant reassessment of what a shooter should be in 2016. Since Halo redefined the genre on the original Xbox, the modern FPS has settled into familiar conventions: slow player characters with recharging health. Firefights based around cover mechanics protecting you against enemies that fire hit scan guns, which always find their mark if you’re exposed. Sprint buttons. Aiming down sights for accuracy. AI companions insuring you never get lost, even in the most linear environments. Limited weapon slots. Doom discards most, if not all, of these conventional design choices. Doom Guy doesn’t have a sprint button because he’s always sprinting. He doesn’t take cover because he can dodge the fireballs, rockets and laser beams of his enemies instead. He always fires from the hip. He carries an impossible number of guns because this is a videogame and the gameplay is all that matters. As a result of this stripping down, combat in Doom is completely thrilling. Never less than at a relentless and breakneck pace, encounters are essentially a series of arena brawls that continually push the envelope of Doom’s fantastic sandbox of enemies, weapons and powerups. Enemies are varied, aggressive and agile – from chittering Imps that scale walls and hurl fireballs, to jetpack sporting revenants and the panic inducing Barons of Hell who dominate the battlefield and pursue you relentlessly. And pursue you they will because Doom Guy is a ridiculously fast, empowering player character to inhabit. Double jumps and ledge mantles keep you one step ahead of the competition while a deliriously satisfying arsenal of guns mean there’s a toy for every situation. Speed and aggression are the key to every encounter and the new Glory Kills system rounds out the sandbox and drives both these factors home as the core of the game. Glory kills are essentially a compromise between health in classic shooters coming from health packs and modern shooters having regenerating health. Damage enemies enough and you stagger them, allowing you to perform a Glory Kill – an outrageous, contextual melee execution. Enemies killed like this are essentially the game’s health packs, exploding like a bloody piñata in a shower of health globes. It helps drive a play style in the game of relentless aggression – want health? Come and take it. The superb combat is helped out by some excellent level design. Levels in the campaign are sprawling mazes and the arena like focal points around which the fighting takes place are layered and complex spaces that reward making the most of your impressive agility to harvest health, armour and power ups. Like Glory Kills, this helps to encourage a dynamic and aggressive play style where staying still or behind cover is actually the least safe way to play. Outside of combat, maps are stuffed full of excellent secrets and collectables, just like Doom of yore, which provide a mix of in game benefits, curios and even extra content including playable levels from classic Doom. Even for gamers uninterested in the magpie like drive to 100% a game, they’re a nearly irresistible hook. Even without secrets to uncover, exploring the environments in Doom is a reward unto itself. This is a seriously good looking game and a technical tour de force. Running at 1080p and 60fps on PS4 is a feat few games have managed, yet alone looking so good doing it. 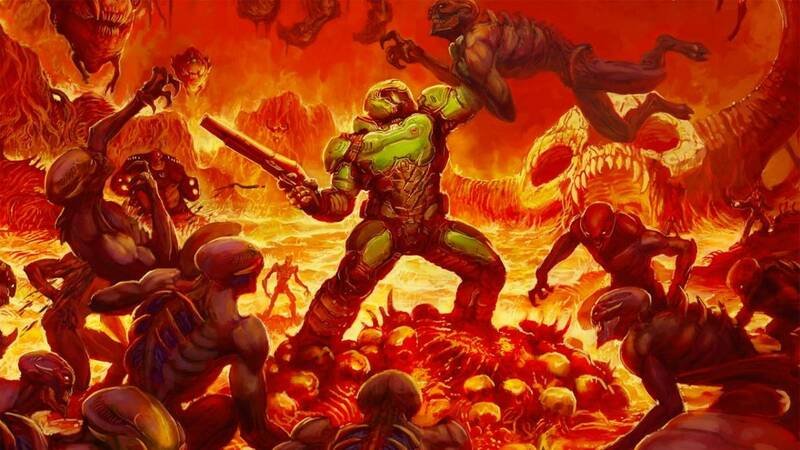 Id’s reputation for technical prowess is already legendary in the games industry and Doom does nothing except reinforce that. Animation and art are also on top form – enemies bounce around the screen with a twitchy physicality and Doom Guy’s presence in the game is a giddy thrill from the overzealous brutality of Glory Kills to the hilariously impatient way he interacts with the damned computers, doorways and lifts across Mars and Hell that dare slow him down between blowing up demons. There’s not a lot to criticize Doom for but it’s not without faults. The story, while largely relegated the background, does occasionally rear its’ head in inescapable cutscenes that break the flow. It’s hokum, too, involving sketchy future corporations plundering Hell Itself to, of all things, solve an energy crisis. Presumably in Doom land, planetary colonisation, terraforming and interdimensional travel all arrived before cheap renewables. It’s easy enough to ignore, however, and at least gives the occasional slice of context for the stunning locations. Multiplayer, too, is a let-down. While serviceable, it lacks charm and is noticeably outsourced. Arriving alongside Uncharted 4 and Overwatch, it’s unlikely to hold an audience, which makes the decision to make it the sole focus of the game’s season pass feel fruitless and frustrating. It’s hard not to imagine ‘what if’ scenarios of money better spent. The verdict is still out on SnapMap, the game’s level editor which is reminiscent of Halo’s Forge mode or the level editor in Timesplitters 2. While it’s great to see level creation in game, especially on consoles, it may prove too limited to provide enough interesting content and certainly can’t match full mod tools on PC. Frankly, that’s about it. Doom is brilliant. As a shooter it’s a breath of fresh air that, rather than being in thrall to recreating the second hand spectacle of blockbuster movies, succeeds because it wholly embraces its’ gaming heritage and puts the spectacle in the hands of players to create themselves. As a tech showcase it blows the competition away and sets new standards for AAA performance on all platforms. Doom was a revolution in 1993 and in 2016 it has emerged from development hell to pick up exactly where Id left off. It’s a masterful return to form and essential.